Red Knots are medium sized shorebirds and the largest of the "peeps". Red Knots are long distance flyers, some traveling over 9300 miles to their breeding grounds in the high Arctic tundra and winter as far south as Tierra del Fuego, Chile. 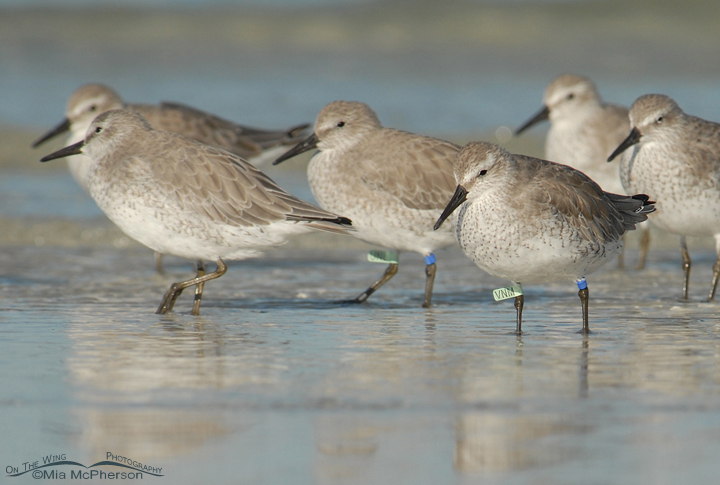 During migration and winter Red Knots are found on coastal beaches, sand bars and tidal flats. 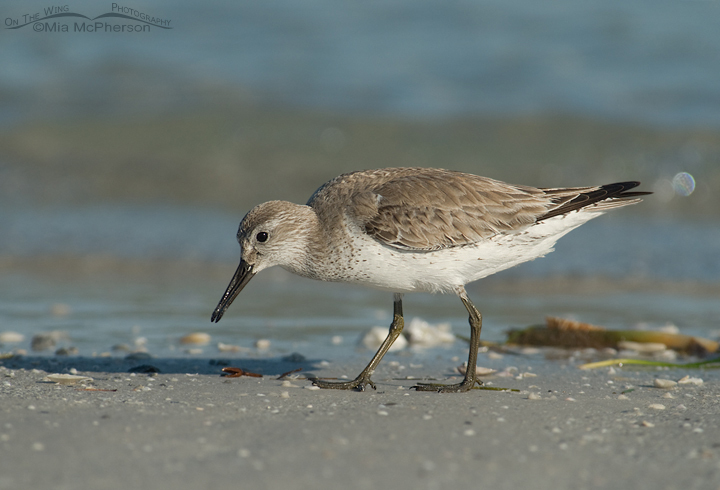 I first became interested in Red Knots on the west coast of Florida where I would see flocks of them resting and foraging on the shoreline. I noticed that many of the knots were banded and I wanted to know why so I began to search for information about Red Knots on the net. I found out that the birds are being banded in North and South America to study the decline of this species and that valuable information is gained about Red Knots by reports of resightings and recaptures of the banded birds. I began to takes images of any banded Red Knot that I saw while out photographing on the coast of the Gulf of Mexico and reported them. I even looked for them on the tidal flats of Panama City and in Costa Rica. Most of the photos I have taken of Red Knots have been taken to document the bands I saw and are not among my best images. 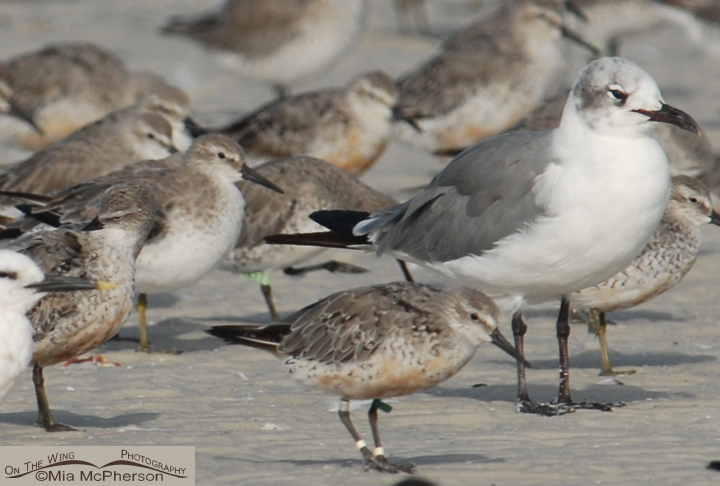 The image above is poor quality but what it shows me is that this Red Knot was banded in Delaware in 1997 (the first year they banded knots there) and that at the time I photographed this Red Knot it was twelve years old! 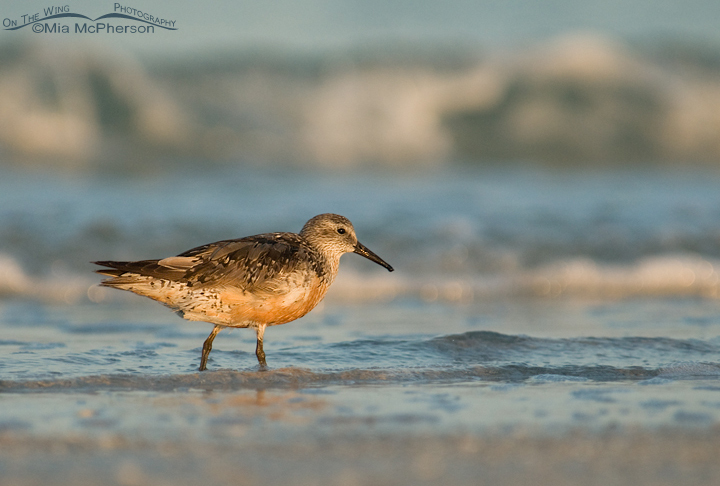 Red Knot populations are in serious decline partly due to the over-harvesting of Horseshoe Crabs along the Atlantic coast of the United States, the eggs of which are an important food source for this species. Red Knots fatten up on the crab eggs during their long migration north and without the stored energy those eggs provide many breeding adults do not have enough body mass to make the journey to the Arctic tundra to successfully breed. Red Knots are on the edge of extinction and without further regulation of Horseshoe Crab harvesting in North America plus additional protection and conservation measures for Red Knots they may well disappear in our lifetime. Very informative post Mia, and great links. Hopefully we can make changes to help the birds. Great post Mia! 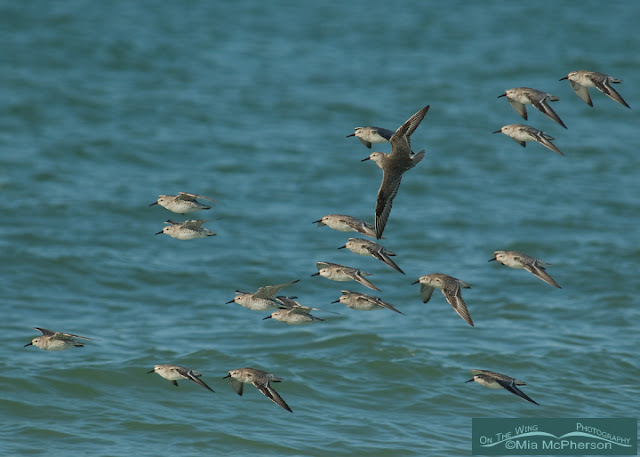 Red Knots are incredible birds; hopefully this species can be revived! Hi Mia, a very interesting post. In the UK we just call them Knot. There are currently around 30000 on my local beach and which make a great spectacle at high tide as they swirl around in tight flocks. Excellent post, Mia! While in the west coast of Florida recently, I noticed many Red Knot groups. I photographed them and only noticed the bands while editing the images. I did report and submit photos of six of the banded birds that I saw. It is truly interesting to see the areas that they visit. I hope that someday soon there will be stricter Horseshoe Crab harvesting regulations. Wonderful post, Mia! Thanks also for the links, especially the PBS video.